The rays of the early morning sun have not yet arrived. Before daybreak, the jungle is like under a thick blanket of darkness and remains in deep slumber. Then starts the sound of the nagada drum. On hearing it, the sun gets up and pulls away from the cover of darkness from the jungles face. Slowly the trees, the hills, and all others rub their eyes and wake up. Birds with their chicks swoop down from the trees to the open space where the sun has already reached. And with their chatter, the sleep of the school children comes to an end. Then one can hear the sound of the footsteps of the children hurrying about at this early hour. By six o’clock sharp, they have finished their morning routines, hands and mouths washed, they sit down to study. At seven, the nagada sounds again, and there is vibrant activity. The clattering of glasses and plates is in the air. It is breakfast time. There are about a hundred children in this hostel, and each one of them takes full responsibility for their daily routine, work, studies, dreams, and aims. 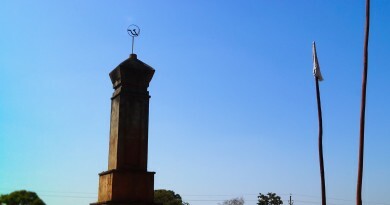 This place – where instead of a ringing bell, a nagada is sounding – is an English-Kurukh school, located on a hill near the village Bhagitoli in Dumari Block, Gumla District of Jharkhand. At the end of the line of children’s rooms, there is my room. The window pane here is broken, but I like it anyway. The window remains closed most of the time, as its probably rusted. But beyond the broken glass, all night long moonlight spreads out. From this room, the morning light appears clearer. And in the early morning, even the jungle looks neat and clean. Across the room, one can see a long chain of hills. This is the borderline between the states of Jharkhand and Chhattisgarh. 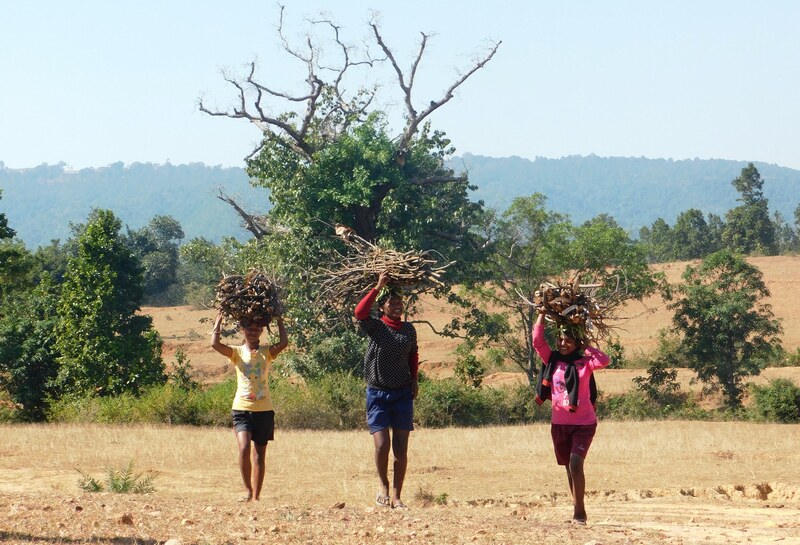 Beyond the hills lies Chhattisgarh and on the plateau on top of these hills live the Korwa Adivasis. Some of the Korwas keep horses. They ride down the hills on horseback. For this reason, the children jokingly call this hill road “horse track”. Just below these hills, on a small elevation is the school and hostel, surrounded on all four sides by hills and the jungle. Since the last 18 years, an English-Kurukh school called “K.K.K. Lurerpa, Luradda has been running here. In this school, about 300 children are educated in their mother tongue Kurukh, along with English and Hindi. Every year a good number of them pass out. They not only receive good marks in the exam, but they leave the school knowing the smell of the jungles and the hills, knowing their native language, songs and dances, and their own distinct indigenous wisdom. This is an education that keeps them deeply connected with their homeland and a kind of school that strengthens them for the future; with their way of being different, with their basic human values, and an education aimed towards becoming a better human being. Boys and girls dress the same in this school, putting on shirts and pants to get ready for class. At eight o’clock, the children assemble in the school courtyard. 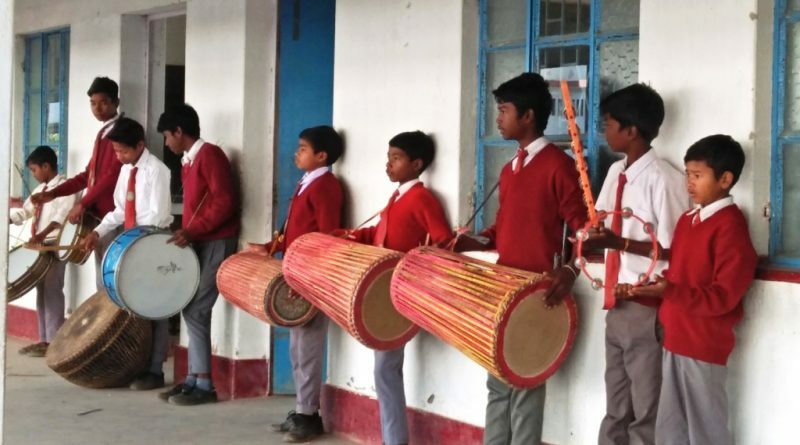 Some children play the nagada drum, and others play the mandar drum and cymbals. Following their tunes, the rest of the children are doing rhythmic steps. Then, after a prayer song in Kurukh, all of them move towards their respective classrooms. The educated people of the Kurukhar community living in the villages around this hillock send their children here to study. Along with being educated, the children are also being connected with all aspects of life like water, jungle, land, and hills. They tell the children about the brave Kurukhar woman, Sinagi Dai, who had fought against the Mughals in Rohtasgarh. To enhance their courage, the children also learn about the war hero Albert Ekka, who was awarded the Param Vir Chakra. They learn about artists who come from Adivasi communities and have earned fame. 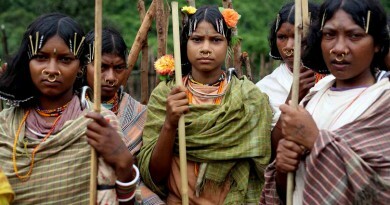 They hear about the life stories of Adivasi singers, poets, storytellers, actors, painters and, intellectuals. Their classes resound with the songs of different seasonal festivals. In the lower classes, the children count in the Kurukh language, singing out the multiplication table. While learning the alphabet, instead of “ka” for “kabutar” (pigeon), they learn the word “kakara”(cucumber). For “pa” they learn the Kurukh word “papla”(butterfly). They also learn these things by singing and dancing. 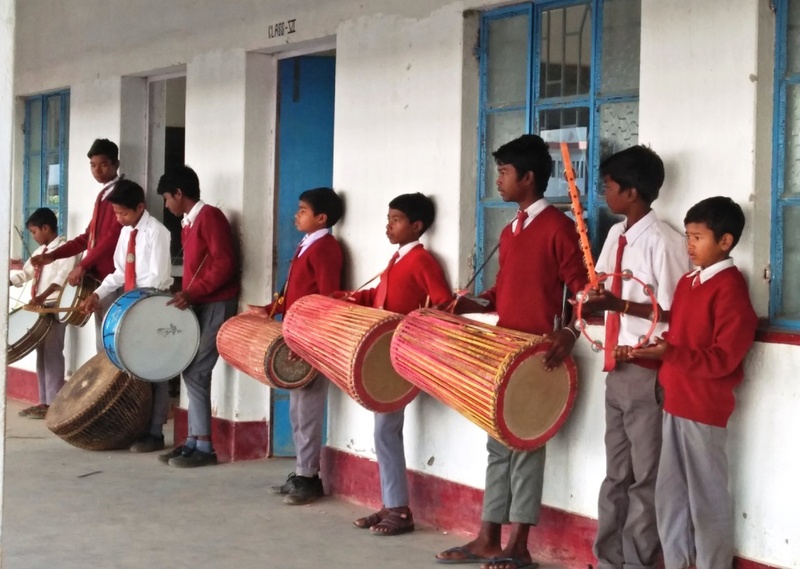 Right from the kindergarten level, the children are taught to read and write in the Kurukh script “Tolong Siki which was officially recognised by the Jharkhand Government in the year 2003. Along with their mother tongue, their English and Hindi are also good. After every two sessions in the classroom, there is a short break. The children go out to the courtyard of the school and spread out into the fields, near the pond and in the jungle to play in their respective groups. The girls play – patthar paani, kho kho, kit kit, and loka goti. Today, the teacher has also joined the girls in playing patthar paani. The boys take long rounds around the hillock. At first, they were playing “gulli danda”, then after a while they stopped to prevent young children from getting injured. The very young children run about and play with the sand. When the nagada sounds again, they wipe off the sand and mud, return to their classrooms and continue to study with much concentration. Sometimes the children are noisy and restless while studying, but they are not beaten because of this. The children have a very close relationship with their teachers and are not afraid of them. They often discuss and play with them. At noontime, when the teachers read the newspaper, some children stand behind them and also read along often pausing to ask the meaning of a difficult word. 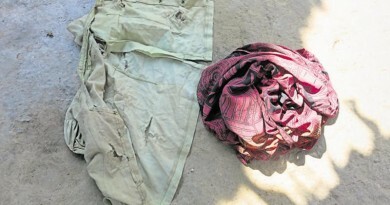 In this area, the Kurukh speaking people do not call themselves Uraon Adivasis, but Kurukhar. History knows that people who speak the Kurukh language are called Kurukhar. 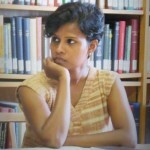 Some say that — in order to belittle and demean them — non-Adivasis named them Uraons. And this continued so that the community was recorded as Uraon in official documents. Later on, educated Adivasis started calling themselves Uraons, and some even use Oram instead of Uraon. But in these places, the word Uraon is unheard of far and wide. The people speak of their community as Kurukhar, and their language is called Kurukh. At two o’clock, the nagada is drummed loudly for the last time. The children storm out of the classroom and come together in the courtyard. For prayer, they sing a Kurukh song and then head to take their midday meal. When the meal is over, they attend to different types of work. The boys take sickles and move towards the fields, where they will cut out the weeds that have come up in the fields. The girls leave for the jungle, from where they bring back dry pieces of wood. Some children pull out vegetables in the garden; some water the new plants; some tend to the grazing cows and others clean their rooms. A few of the older boys are preparing the evening meal in the kitchen – cutting vegetables and cooking rice. On Sunday, all the children go out to the jungle. They are not afraid of the jungle and the hills. In groups of two, they spread out through the entire jungle and search for dry pieces of wood. The younger children make bundles of small pieces of wood. In between the children raise their voices and call to each other. The jungle resounds with the noise they make. The girls sing songs about the right time to pick up leaves and pieces of wood. Some children are occupied with eating the khunti fruit, which is found in the jungle. While working in the jungle, both boys and girls wear shorts for more comfort during work. There is no frowning at all on the boys faces because of the girls dress. They are all equal, doing the work together. In the Kurukh language, girls are talking with boys like boys, and with girls like girls. Here girls are not just girls, but human beings first. This is one difference in the Kurukh language. They can speak both, as a woman and as a man. All are comfortable in their language. It is one type of education that connects them to the land, that connects them to such activities, that makes them expert in this, and that is deeply connected with their life and routine. This is an education that ultimately connects their future with their own language, their own culture, and their own soil. At the initiative of Dr. Zephyrinus Bakhla, the people from this place formed an organisation called “Erpa” (meaning house), which made the plan for building this school in 1999. During construction, water was a major problem. Initially, people went to the hills for drinking water and carried it down over a distance of four to five kilometers. The villagers discussed this issue a lot amongst themselves. Under the leadership of Dr. Bakhla, and with the help of the villagers, a water spring was located on the hill. He did not want to make a deep boring, considering that then the water flow would become less and increase the water problem of the Adivasis living around there. For many years, their water has been sourced from this natural spring and so the people call it spring water. It never dies down, even in days of great heat. Such watercourses are the origin of springs on the hills and small streams, and they provide moisture to the jungle. A four-kilometer-long pipe had to be made from the top of the hill to the hillock on which the school was to be built, to carry the water. By the time the school was constructed, it was ready. Without electricity, the water that comes through the pipe flows down one hill, climbs another hill and then reaches the school. It even reaches a tank on the top of the second floor. This water flows up to the fields and gardens where vegetables are grown. The pressure of the water flow from the hill has so much power that the pipe often breaks, and the water finds a new way down. The schoolboys climb up and repair the pipe. As soon as the pipe is fixed, the water quickly flows down to the school hostel and the children joyfully dance at this sight. In this school, the children learn all kinds of songs for occasions like Karam, Sarhul and weddings during the course of their studies. When the time comes, festivals of Nature like Sarhul or Karam, are celebrated here in a great manner. At the time of the Karam festival, the boys and girls of the school go out into the jungle and cut branches of the Karam tree. And when they meet again they dance and rejoice. In these modern times, as urban education cuts off children from natural life, soil, land, air, and water, ultimately cutting them off from the meaning of their existence; here at K.K.K. Lurerpa, Luradda, the children are not only learning their own language but also learning to connect with life, community, culture, and land. They are learning to grow up in a simple, genuine manner and with natural conditions that are fit for humans where jungles, hills and all of nature grows in its natural process. This post has already been read 1549 times!